SIX SETS for the price of FIVE! 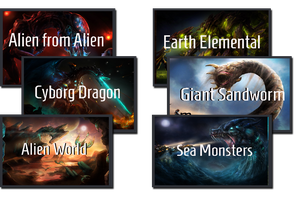 : Alien from Alien, Earth elemental, Cyborg dragon, Giant sandworm, Alien world and Sea monsters. This great value SoundPack is HUGE! At least the creatures packaged up for you here... are HUGE. Huge and angry.... brain suckingly, bone smashingly angry. Grab this SoundPack and then unleash an evening of Sci-Fi horror on your players!